The Square of Saint Mark抯, Venice, 1742/1744, by Canaletto (Italian, 1697�68). Published with the National Gallery of Art. Thoughtfully conceived and engagingly intricate, our 1,000-piece interlocking jigsaw puzzles combine superb color reproduction, stunning and unusual images, and sturdy construction to delight generations of novice and veteran puzzle workers. 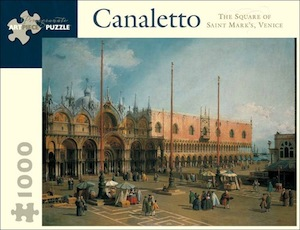 Puzzle size: 27 x 20".